The Independent National Electoral Commission (INEC) has on Wednesday presented a certificate of Return to the governor elect, Gboyega Oyetola and his deputy Benedict Alabi. Osun state governor-elect, Alhaji Gboyega Oyetola has promised not to disappoint the people of the state who gave him the mandate in September 22 governorship election which was concluded last week Thursday. 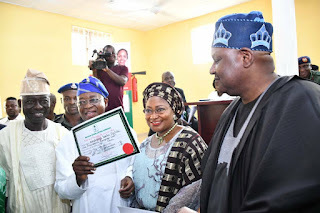 Oyetola gave this assurance on Wednesday shortly after he was presented with the Certificate of Return as the governor-elect by the Independent National Electoral Commission, in charge of Oyo, Ekiti and Osun states, Prince Adedeji Soyebi, presented Oyetola with the Certificate of Return at a ceremony held at state INEC office in Osogbo, the state capital. Deputy governor-elect, Mr Benedict Alabi also received his Certificate of Return at the event. Speaking after he was presented with the certificate, Oyetola said the people of Osun will continue to enjoy the benefit of good governance in the state. Oyetola who vowed to justify the confidence reposed in him by the people of the state said he would run all inclusive and participatory government. He said: "I want to assure the people of the state that I will serve to the best of my ability and I will run all inclusive and participatory government. " "I will always consult majority of stakeholders in the implementation of the policies and programmes that would have positively effect in the lives of the people of the state. " "I will run people's friendly government. The focus of my administration will be the welfare of the people of the state. We are going to work together to ensure that we justify the confidence people reposed in me." The governor-elect commended the electoral body for doing what he described as an “excellent job” in conducting the governorship poll. The governor-elect noted that INEC should be commended for conducting a credible election in the state. He also commended the security agencies for providing security back-up which gave the electorate confidence to come out and exercise their franchise. Commending Governor Rauf Aregbesola for giving him the opportunity to serve under his administration, Oyetola also appreciated Aregbesola for preparing him for the task ahead. Oyetola hailed the APC National Working Committee (NWC) led by the National Chairman, Mr. Adams Oshiomhole and the State Executive Committee led by the State Chairman, Prince Gboyega Famodun. The Resident Electoral Commissioner (REC), Okusegun Agbaje, expressed delight that the election confirmed that the election was free, fair and credible. Agbaje commended the people of Osun State for the maturity displayed before, during and after the election which he said was successful. "It is important to point that the successful outcome of the Osun state governorship election would not have been possible without the cooperation of the electorate who came out in their large number to vote for the candidate of their choice." "This is a vindication of our repeated declaration in the run up to the election that only the people of Osun state with their PVC will decide the winner of the election and not INEC." "Just like the first round of the governorship election on 22nd September 2018, the supplementary election substantially met global best practices in conduct of the election as adjudged by the vast majority of the stakeholders especially many party leaders in Osun state "